We have three locations where private workshops can be held. Scroll down to see which one suits what you’re looking for. Enjoy a private workshop for two to three people in our Baltic triangle studio. 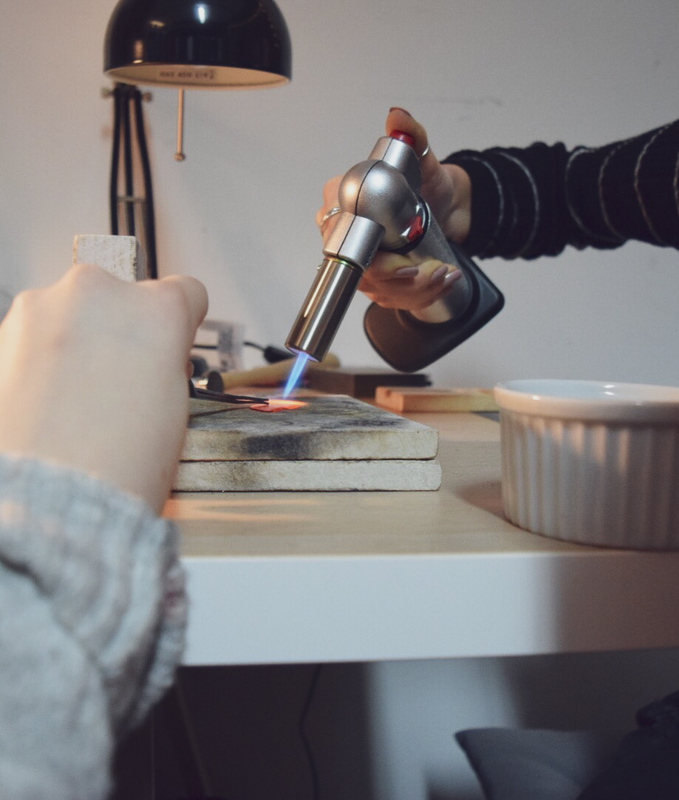 Our little, cosy studio is set up perfectly for two people to enjoy a relaxing couple of hours mid week making jewellery with one of our tutors. If you can’t find the any suitable dates or times at our most popular workshops you can arrange to attend them here. We are located above The Baltic social restaurant and bar, opposite ghetto golf and just a 3 minute walk away from the Baltic market. Our bookable hours for these workshops are 11am - 5.30pm Monday to Friday and most workshops last about 2 - 2.5 hours long. However we sometimes have evening slots available also. To enquire about a workshop or request a booking please use the contact at the bottom of this page. We have the perfect space for large groups located in the Baltic Triangle. We have access to a lovely sunlit meeting room as part of our Baltic Triangle space which is ideal for larger groups of up to 12 people. We can provide light refreshments and nibbles, photography, polaroid photos to take home on the day and a gift for the head of the party is included. Our bookable hours for these workshops are 11am - 8pm 7 days a week. Most workshops last about 2 - 4 hours long (Time will increase depending on workshop and number of participants). Weekend dates are few and far between so please request to book at least 4 to 5 months in advance to have a chance at securing a weekend. Our favourite studio located a 3 minute drive away from the Liver building, jam packed with specialist tools for advanced workshops. All of our workshops can be held here and we can tailor make workshops to suit you and your party.